Today we're happy to announce Multi-Factor Authentication for the TrueVault Management Console. Many of the threats our customers face are the result of human, not technical, errors. Social Engineering encompasses a broad range of attacks that are especially difficult to defend against because they exploit human mistakes: clicking on a phishing link, typing a password in public, running dubious software, joining an untrusted network, etc. TrueVault is working hard to keep your data safe even when authenticated users aren't necessarily trustworthy. 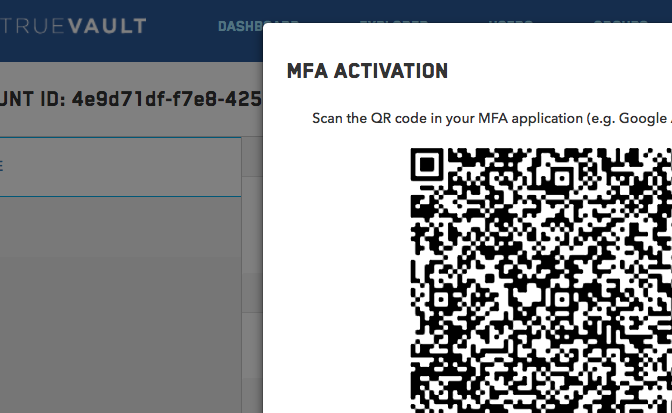 MFA is the first of what will be a long line of security-focused enhancements that will keep your data safe from real, modern threats. Check out our MFA guide to see how it works. We strongly recommend you enable it today.